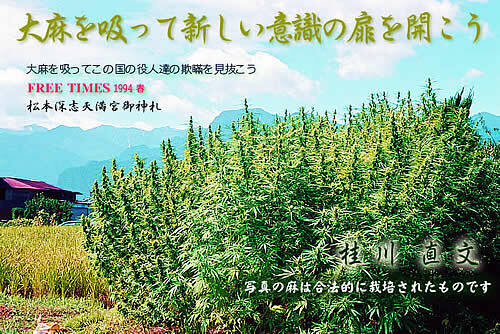 In the modern times where cannabis is known throughout the world for its positive properties,the reason this plant is against the law in Japan is not because it is a public health matter, or because it is a menace to society, but simply because it is ‘against the law’. We have spent the last ten years or so on every possible occasion to inform the government, bureaucrats and the law enforcement community in Japan that such laws that incriminate pot-smokers and growers to be unconstitutional. However, their answer is always the same… ‘Then you must change the law’. This apparently is the mentality of our civil workers, who are supposed to work for the best interest of the people. Just how much further can they insult the people? There is a Japanese word, ‘Tax Thief’. This used to be an insulting term for the Japanese Self Defense Force during the high growth period of the Japanese economy. Under cold war, the Japanese Self Defense Force was completely incapacitated, and after they lost the World War, the Japanese military was stripped of all authority. However, if you were to ask who is really at fault of the war, you may come to a conclusion that the bureaucrats played a bigger role in this aspect. The Imperial Forces did not point their guns at the people, but the bureacrats of the time centralized all thought and under mind control, locked up those who would not listen. The reason being, because it was ‘against the law’. …And they have never owned up to it. After the war, we learned in school that Japan shifted from a military regime to a peaceful democratic country, but this was simply not true. The General Head Quarters (GHQ) lead by Douglas McArther kicked out just the military elements, and the rest of the system remained under a different name. Currently, all cannabis related judicial affairs, prosecution, policing, and the Ministry of Health and Labor (which acts sort of like the DEA) are all based on the old Department of Interior Affairs. pathetic truth about our current government. Looking back, those who smoke weed in Japan under prohibition are fortunate. This is because at some point, they chose free will over self interest. Besides, who’s business is it really what other people may choose to smoke or eat. If one’s actions cause harm to others, a free willed person shall understand this concept. Pot smokers know that if you don’t change, the world won’t either. That’s why I teach the way of cannabis, and smoke with many others as possible. I really hope Japan will open up on the possibilities of marijuana being legalized. I completely support activists for the marijuana battle. I live in Kanagawa and I realize the laws are very strict. I hope for the best!